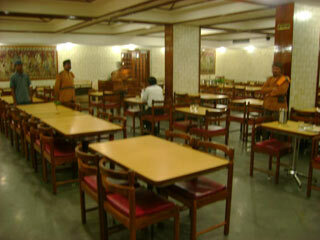 Hotel Mayura lies in the heart of Tirupati, opposite the bus stand. It is 15 kms away from the airport and just half a kilometre away from the railway station. It provides easy access to the temple. Hotel Mayura offers modern conveniences along with warm hospitality at affordable prices. Security Guard, Laundry Facilities, Breakfast Services, Business Facilities, Backup Generator, Restaurant, Travel Counter, Airport Transportation, Room Service, Complimentary Newspapers in Lobby. Attached Bathroom, Air Conditioning Room, Cable/Satellite TV, House Keeping, Wakeup Calls, H/C Water, Iron/Ironing Board, DVD Player, Toothbrush/Razor on Request. User reviews for "Mayura Hotel Tirupati"